The most stunning sports injustice I've ever faced was during a water polo game fall of my senior year of high school. Water polo can be absurdly brutal because the pool’s surface provides a translucent-at-best scrim underneath which the referee cannot see—and thus can’t call fouls. In this particular game against Newark Memorial, the hole set had a much larger wingspan than I, and at one point he grabbed my wrist and pulled it far enough below the surface that I couldn’t breathe. He probably only did this for 5-7 terrifying seconds, but it was enough to induce deeply primal fear in me. I wriggled out of this literal death grip and climbed this kid like a ladder. From there, I proceeded to curl my body around his head, trying in vain to drown the guy. It was with only slightly less of a sense of injustice I approached tonight’s social soccer match. 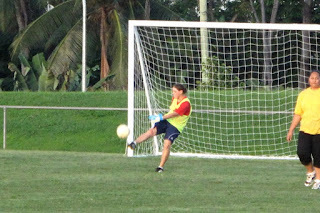 PCV Erica works for the Samoan Soccer Association, and she has served as team captain for the Peace Corps’ team over the past seven weeks. 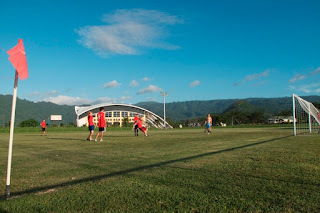 Our games have always been on Friday nights, and for the great majority of the time, the games have been lively and competitive but still fun. 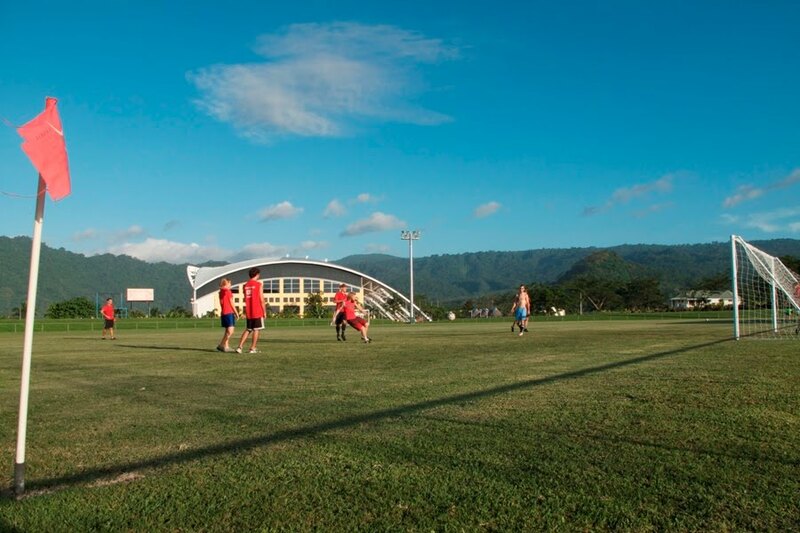 We’ve played such local teams as Punjas, Lesa’s Telephone Services, and UN/SPREP, and we’ve had a great time. We played Friday evening. The first half of the game was uneventful, save for the goal we scored. The ball had sailed toward the sideline on a kick from our backfield, and I passed the ball in from the sideline just before it went out. The other team, who shall remain nameless, thought it should have been called out—our team took advantage of the confusion and scored. The second half grew much more heated as the game became more rough and confrontation escalated. At the peak of this conflict, a player from our team was negligently kicked in the head/neck and was knocked out cold. We loaded this player on an ambulance, and the game pretty much ended then and there. Three days later (errr... yesterday), the other team protested. They claimed we had abandoned the game. Nevermind that one of our players was taken away in an ambulance and another rode along to the emergency room; apparently the rest of us should have finished the game. The other team somehow also successfully argued that we should have to forfeit the goal we’d scored in the first half, and that the entire game should be replayed. The re-match was scheduled for tonight. One of our players couldn’t play tonight on account of the concussion he’d sustained in Friday’s game. So we showed up tonight with six players and no subs. The other team showed up with enough players to field an American football team—it was as though they had squads to rotate in and out. We managed to score a goal—a header off a corner kick—but of course the other side dominated, and we lost 6-1. Our 1-0 game stolen from us, we sauntered off the field, completely disenchanted with The Powers That Be. I hope you’re well. Tommy’s pictures from Friday’s match below. 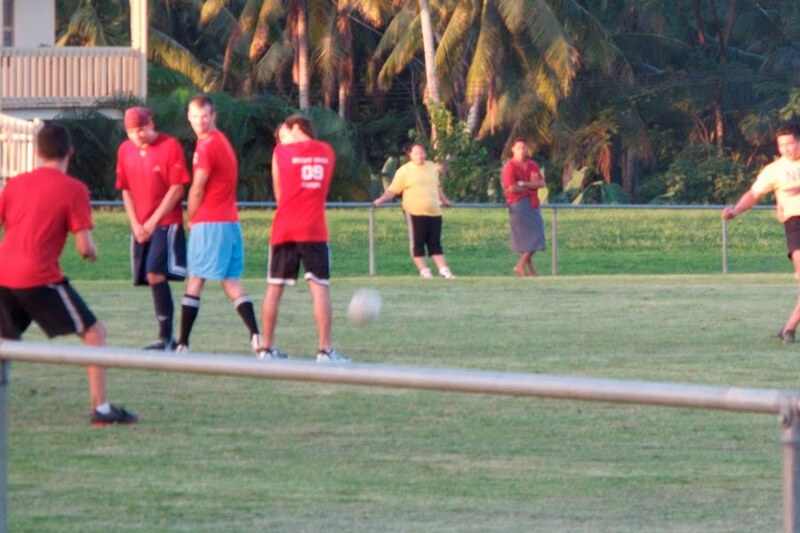 Joey 81, an inimitable force on the Peace Corps Samoa soccer team, and Casey 80, who sadly made his exit last night. 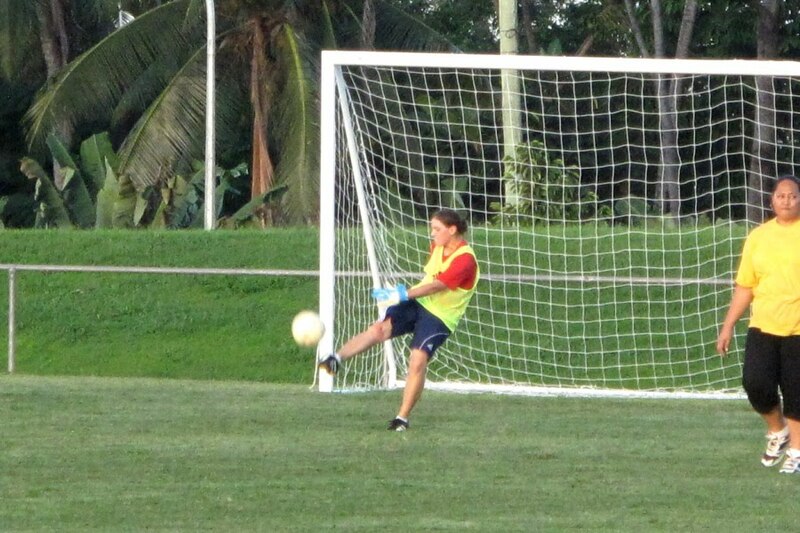 Erica 80, our all-star goalkeeper. No really. Opposing teams are unanimous in their awe. She's amazing. Joey 81, Jordan 81, and Ben 80 forming a wall in front of the free kick. This ball deflected off Ben's unguarded shin. Me on the far left. Place an asterisk by their win. 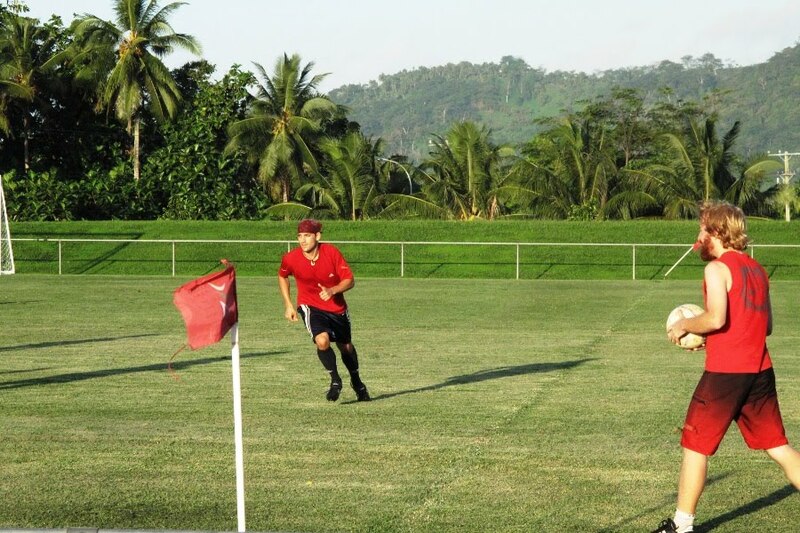 Samoans have are very competitive, it's all the anger that is bottle inside that come out during games.